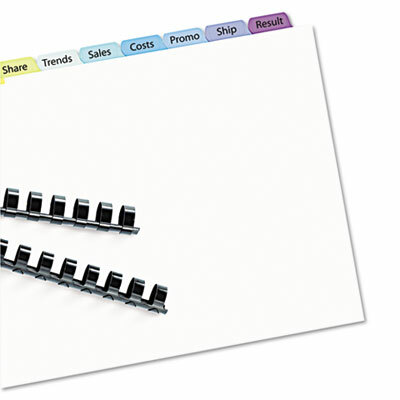 Print, then apply the clear labels from the Easy Apply™ label sheet to the divider tabs all at once! Labels virtually disappear on colorful tabs for a contemporary look. Print, then apply the clear labels from the Easy Apply™ label sheet to the divider tabs all at once! Labels virtually disappear on colorful tabs for a contemporary look. Laser and inkjet compatible.